I am the co-founder of Outside, a community tasking app that makes it easier for people to help each other with their daily inconveniences. Our team is made up of students and fresh graduates who are passionate about tech and the sharing economy. We have previously attempted several business ideas together and ultimately got back together to build Outside. This is how we failed, and then realised it gave us what we needed to succeed. I met my co-founder and friend, Dion, back at a social entrepreneurship program in secondary school. After graduation, we decided to try starting up businesses together. Within a few years, we attempted six different ideas, ranging from tech-enabled crowdsourcing, sustainability, gaming, to even contract jobs and events. After testing out multiple concepts, we finally arrived at the idea of creating a platform that would make it easier for people to help each other. And thus, Outside was born. Like most people who lack the ability to build an app themselves, we resorted to outsourcing. However, the experience was not the best. The constant check-ins with the outsourced developers were very time consuming and the development process took three months longer than what was planned. Worst of all, the app did not perform as expected. The six months of designing and gathering feedback led to more functions, and a much bigger price tag. The constant unexpected delays and changes were slowly diminishing our savings. Soon, we realised that we had to raise more money or drop the app. As 20 year-olds, this was the toughest decision that we had to make. We considered borrowing money and even tried to apply for bank loans (the banks obviously rejected). Ultimately, with rising tensions and tighter finances, we had no choice but to let go of the app. However, soon after, Dion and I felt that it was possible to pick up programming by ourselves to save the app. The journey was not at all smooth. While learning and building the app, we hit roadblocks such as learning a framework that couldn’t support the required functions and had difficulty seeking help. We failed to hit our targets and the release for the private beta was pushed back for nearly three whole months. While rushing for the private beta release, we were constantly in the office till the last public commute. This routine of pushing ourselves only resulted in burning out and increased tensions within the team. After realising the detrimental effects of our working style, we agreed on building a proper work schedule and system to better manage our work process. Then, with everything in place, we managed to launch our private beta in December 2018. While we also initially intended for our public beta to launch in December, we received several crucial feedback and noted problems from our private beta testers. This led to us making the decision of doing a controlled scale test instead. Doing so allowed us to focus on understanding our current testers and helped us in better-adding value to the app. After fixing up issues and restructuring the app we successfully (and proudly) launched the public beta of Outside in February 2019. 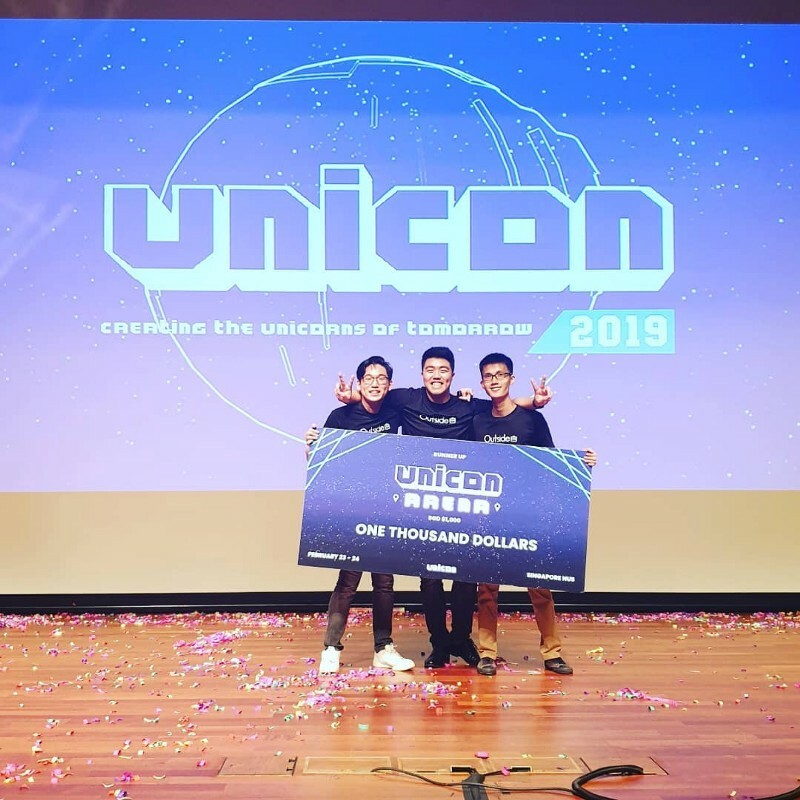 At this point, we were very lucky and thankful that we were given the opportunity to both open our first booth and pitch for the finals at Unicon Arena 2019. We came in as the runner up within 48 hours of our launch too so yay! Don’t look at outsourcing as your only option to build the business, there is a huge existing pool of free resources to pick up the basics; Codecademy for programming and Google Digital Garage for digital marketing and many others as long as you try to search for it. As always, Google and Youtube are your best friends. There are also countless of tutorial videos and guides available for app development and most things startup related. I was actually able to attend all the Blitzscaling classes in Standford thanks to Greylock’s Youtube channel. In order to make things move faster, I ended up setting strict deadlines for the team which only led to ineffectiveness and burnouts instead. Try to understand the difficulties and make changes to the plans where necessary, allowing the team to suggest their own deliverables will make also help them feel more responsible for their work (Its good to read up on OKRs). You’ve probably seen this in the context of a Bear Grylls meme but it’s true, the startup life is mostly about adapting, improvising and (hopefully) overcoming the obstacle as it comes. There should be a limit on the “In the future/next time” talks and more focus on the “now”. You could be really excited about the future and lose sight of what needs to be done for you to get there. It’s always good to give some future talk to boost the team morale, but make sure to stay in the present and don’t plan ahead if you are not done deciding on the next few actionable steps. Lastly, do NOT be afraid to reach out and ask for help. When I was starting out, I was really reluctant to ask for help because I was afraid of them doubting my ability as a startup founder. Although it took me quite some time to get out of my comfort zone, I’ve learnt so much from getting people’s input and sharing of experience. Also Read: Digital partnerships: When is agency experience an asset or a liability? You should still research and read up on whatever you can before you ask for help. It’s wasteful to take up people’s time to explain things you can read about online when you can learn much more from their practical experiences. Although we have already launched our public beta, we are still very much at the start of our journey. We recently onboarded new members and are currently preparing for our demo day in mid-April. We are also currently getting more beta testers so that we can collect more feedback to improve on the product. There are also several pretty interesting functions coming down the pipeline that we are very excited to share. We hope everything works out for the best, and even then, to stay grounded, appreciate failure and never give up! All the best to all the startups out there. Outside is currently in Cohort 1 of The Start, a pre-accelerator program by StartupX and Temasek and Cohort 2 of Found8’s Elevate.SG. Keep an eye out for them here.